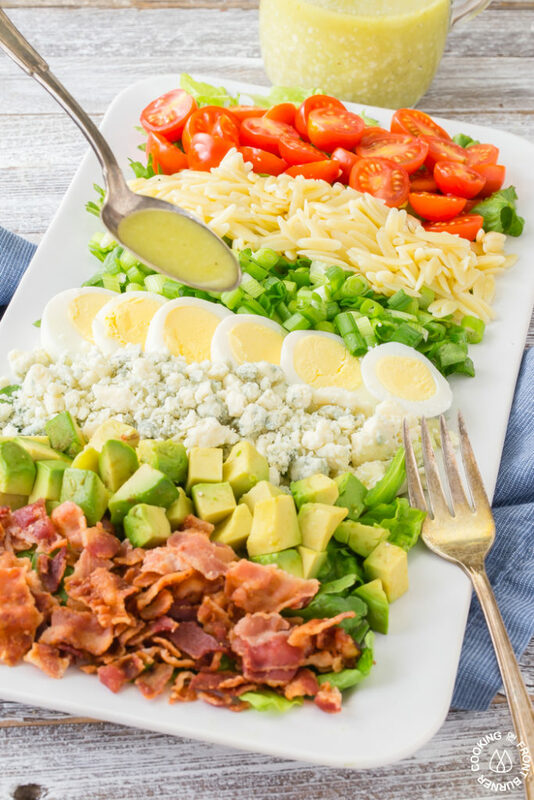 This Cobb Salad is a flavor explosion with crispy bacon, tangy blue cheese, fresh tomatoes, avocado, green onions, hard boiled eggs nestled on a bed of romaine lettuce and drizzled with an easy blue cheese vinaigrette. And in case you didn’t notice, it has my favorite pasta, orzo, to give it a unique twist! 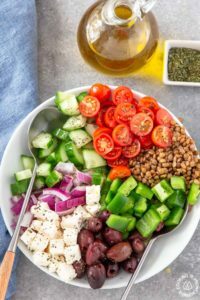 Summer time is salad time and today this beauty is going to be your new favorite one! It has all your traditional flavors plus the addition of tender orzo pasta. Call me crazy but I love the texture of pasta in salads – must be the Italian in me! 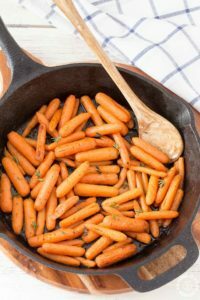 Whether you want this as a side dish or a main course, just be sure to make it soon and watch it disappear. 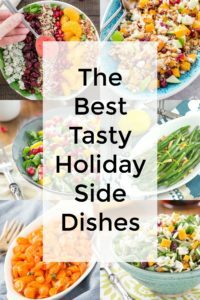 You, your family and guests will enjoy this easy to make dish and ask for seconds! I’ve been on such a salad kick lately and the more “stuff” in them the better. There’s nothing like all the fresh ingredients you can get this time of year especially from your local farmer’s market. I’m like a kid in a candy store when I’m walking around. Most times I have a hard time decided what to get. Everything looks so good! I want it all but with only the two of us in the house, I t-r-y to keep picking my produce at a reasonable level. 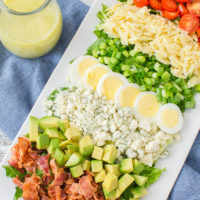 So the DIY Guy and I had this the other night for dinner and he had no idea what a cobb salad was so the curious engineer in him had to google it. He was teasing me a bit since a classic cobb has grilled chicken but I decided to leave that out (just for the ease of making the salad) and decided to opt in the pasta. Feel free to add the chicken for a nice boost of protein. 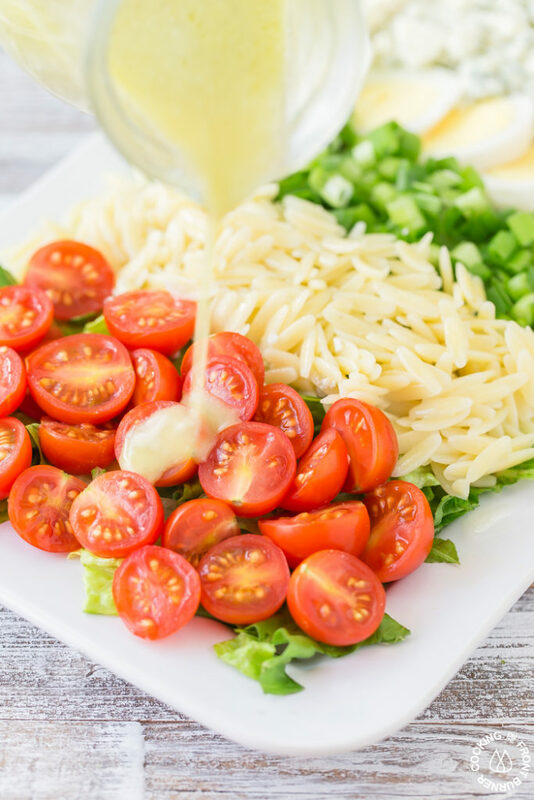 And speaking of pasta in salads, be sure to try this family favorite that is super crunchy with veggies and drizzled with a poppy seed dressing. 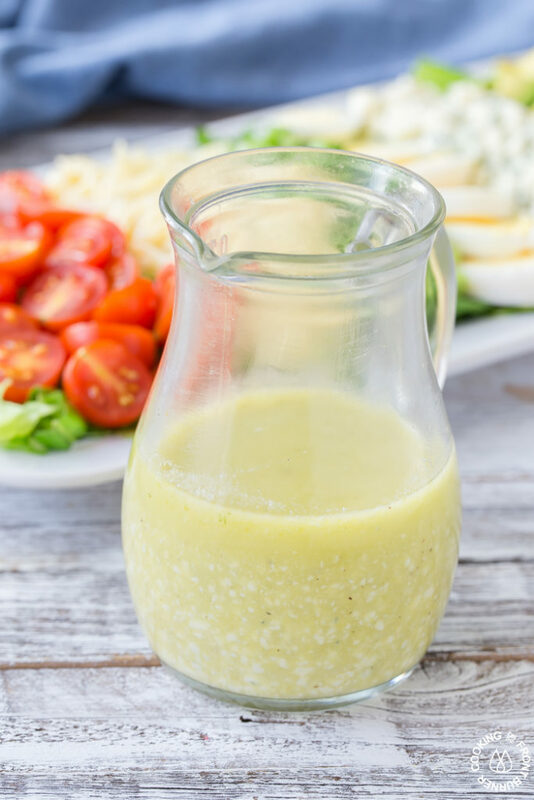 You are also going to love this blue cheese vinaigrette – it can be used on any salad and is sweet and tangy! 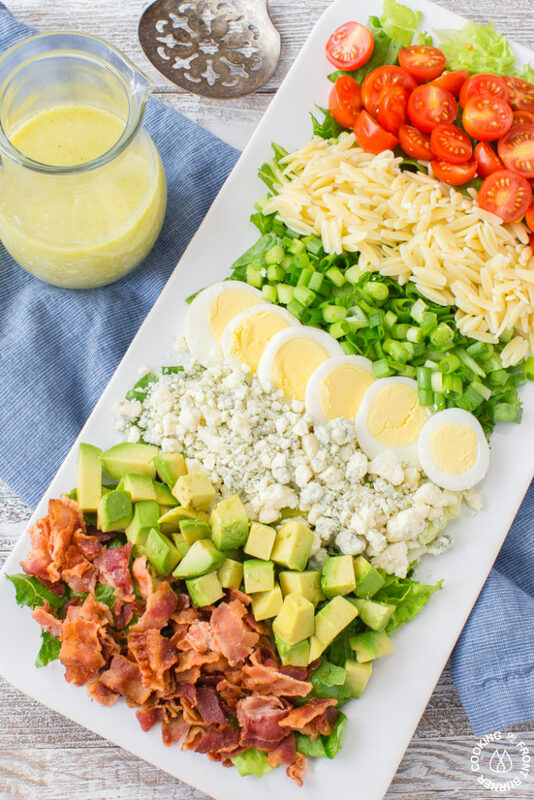 This Cobb Salad is a flavor explosion with crispy bacon, tangy blue cheese, fresh tomatoes, avocado, green onions, hard boiled eggs nestled on a bed of romaine lettuce and drizzled with an easy blue cheese vinaigrette. And in case you didn't notice, it has my favorite pasta to give it a unique twist! 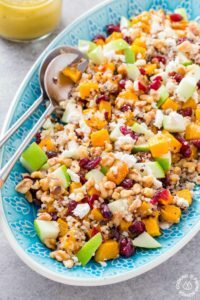 Drizzle with dressing - you can also just place everything in a large bowl and toss. You will have extra dressing that will keep in refrigerator for about 3-4 days. Enjoy – you can make this! 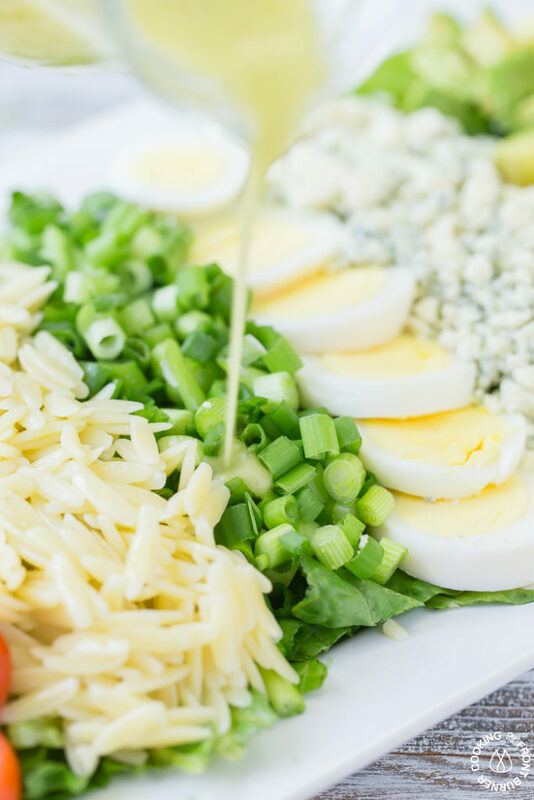 If you love anything cobb, be sure to check out this dip from Cathy too!